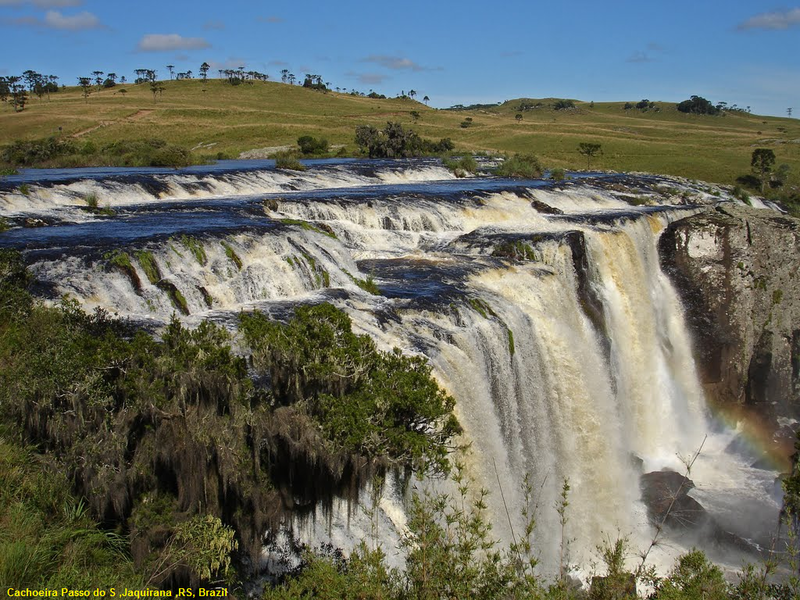 The vegetation and waters meet in a stunning landscape in the Passo do S Waterfall, located in the municipality of Jaquirana , in the Rio Grande do Sul Mountains . It is here that the Tainhas River gives rise to an S-shaped slab, which gives its name to the place. From one bank of the river to the other, they are more than 80 meters wide.A great waterfall with different angles and levels of fall, which together with the araucaria fields and pines in its surroundings, forms a spectacular scenery. The river follows to a waterfall with 15 meters of height. The site, which is inside the Tainhas State Park, is open to visitors. However, hunting, fishing and camping around the waterfall is prohibited. Passo da Ilha, 21 kilometers from the place, has a structure for camping. When the river is at its normal level, it is possible to cross it by car, on horseback or even on foot. Passo do S was formerly used as a passage for tropeiros crossing the region. Created by decree in 1975, Tainhas State Park is an area of ​​6.6 thousand hectares spread by the municipalities of Jaquirana, São Francisco de Paula and Cambará do Sul .The place is deserted and virtually devoid of trees to shelter from the sun, does not offer any structure, but is ideal for spending the day, with river points conducive to bathing and slabbing for children's fun.